There are many intriguing sites on the grounds of the Tennessee state capitol in Nashville. 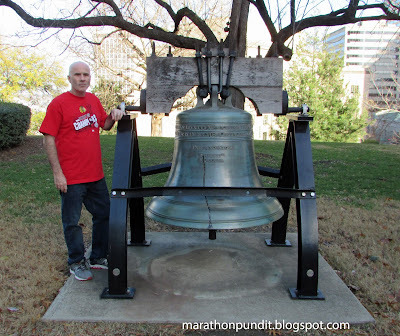 Mrs. Marathon Pundit and I visited America's Music City in early December. 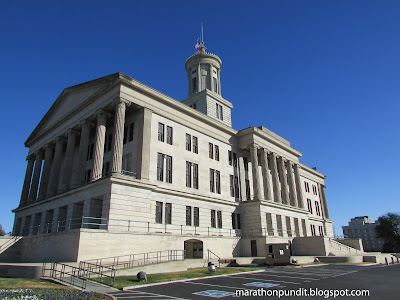 William Strickland was the architect for the state capitol, it is in the Greek Ionic style, which is appropriate as an old nickname Nashville is "the Athens of the South." Strickland died five years before its completion--he's buried on the northeast wall of his creation. The limestone building opened in 1859. Paid laborers, along with convicts and slaves, worked on the construction crew. The Tennessee capitol, according to Wikipedia, is one of only twelve that does not have a dome. The capitol is open for tours on weekdays--but we visited on a Sunday. The flags were at half staff as George H.W. Bush had passed away two days prior. The capitol rests on a hill. Andrew Jackson, Old Hickory, our seventh president, is the Great Tennessean. 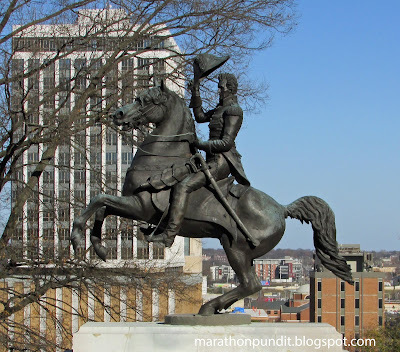 A statue of him on horseback rests on a prominent location at the capitol. And as you can see, the capitol building sits on a hilltop. Scroll down to the bottom of this post for more about Jackson. 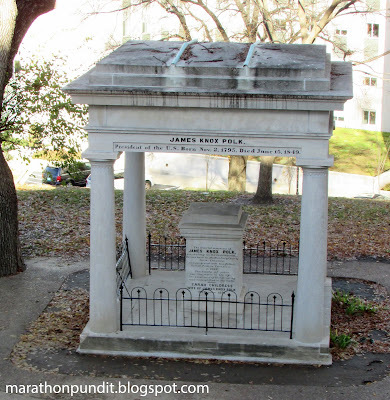 Pictured here is the burial site of James K. Polk. Eight years after Jackson left the White House one of his protégés, Polk, was sworn in as our 11th president. His nickname was Young Hickory. Like Old Hickory, Polk was a man of action. His goals as president included annexing California and at least some of Oregon Country. Polk favored adding the Republic of Texas as a state during the campaign; his predecessor, John Tyler, three days before he left office, signed the bill that allowed the admission of Texas into the union, which occurred during Polk's first year in the White House. The Oregon Country was split by treaty with Great Britain at the 49th parallel in 1846, two months after the Mexican War began. 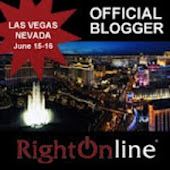 That conflict not only led to the annexation of California, but an area that later became Utah, Nevada, Arizona, and as well as parts of Colorado, New Mexico, and Wyoming. Polk vowed to serve one term--and he did. Here's a man who came to the White House, said what he would do, and did it. Young Hickory's retirement was very short. The strains of the presidency took a toll on his health and he died of cholera in Nashville three months after his term of office ended. His wife, outlived him by 46 years. Both were initially buried at their home, Polk Place, but were reinterred on the state capitol grounds in 1893. Two years ago a resolution to reinter, again, the remains of the Polks to their old home in Columbia, Tennessee was narrowly defeated by the state legislature. Polk is the only president to serve as the speaker of the House. 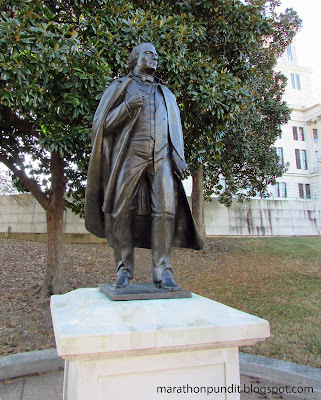 He also served a term as governor of Tennessee. He was born in North Carolina, not too far away from Jackson's birthplace. 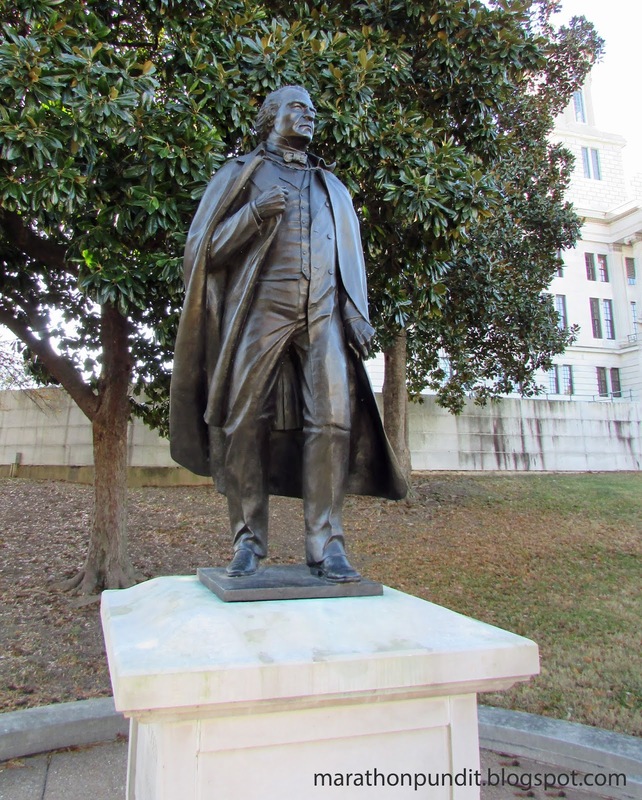 He is, as of now, the only president buried on the grounds of a state capitol. Another former governor of Tennessee who was born in North Carolina who became president was Andrew Johnson. That's a bronze statue of him. Johnson succeeded Abraham Lincoln and was one of the targets of John Wilkes Booth's assassination plot. Johnson's designated assassin, George Atzerodt, chose to get drunk instead. He still was executed for his role in the plot. By all accounts Johnson's four years in office were a debacle, he is generally ranked by historians as one of the worst US presidents. He possessed none of Lincoln's skills as a compromiser and he was impeached, unfairly to be sure, for violating the Tenure of Office Act after he fired Secretary of War Edwin Stanton. Johnson was not alone in believing the law was unconstitutional--it was repealed in 1887. Johnson missed being removed from office by one vote in his Senate trial. 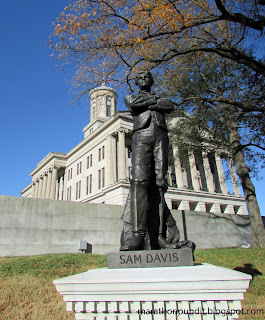 He received some redemption when the Tennessee legislature elected him to the US Senate in 1875, a position he held when the Civil War broke out. But the hostile historical verdict on Johnson, because of his opposition to most of Reconstruction, seems set. He was the wrong president for that time. 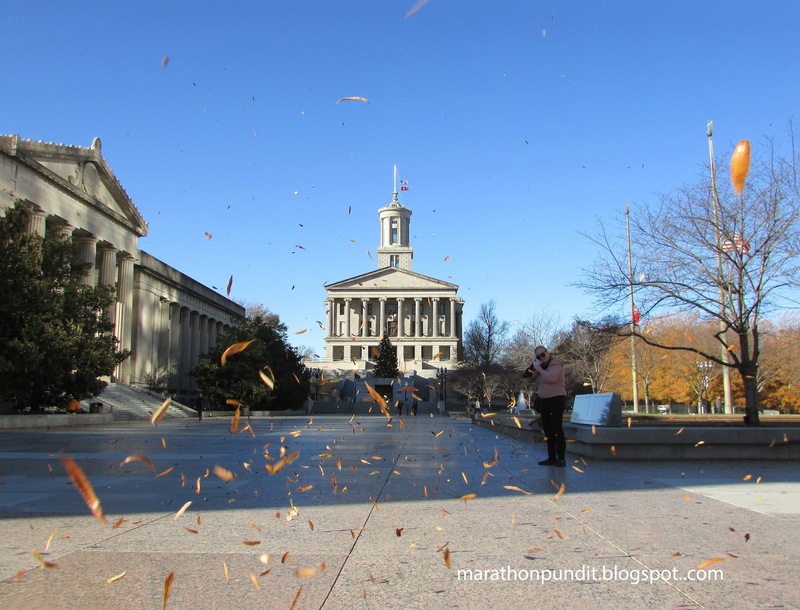 All three Tennessee presidents were Democrats. Simply put, Sergeant Alvin C. York was one of the greatest men ever to put on an American military uniform. During the closing days of World War I, York, who was from rural Tennessee, led an attack that killed at least 25 Germans and captured 132 others. He was awarded the Congressional Medal of Honor. 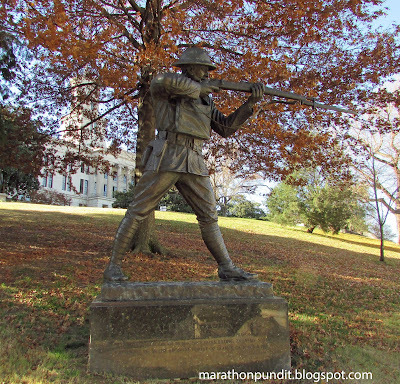 His heroism was immortalized in the movie Sergeant York. Playing the title character, Gary Cooper won a Best Actor Academy Award for his performance. 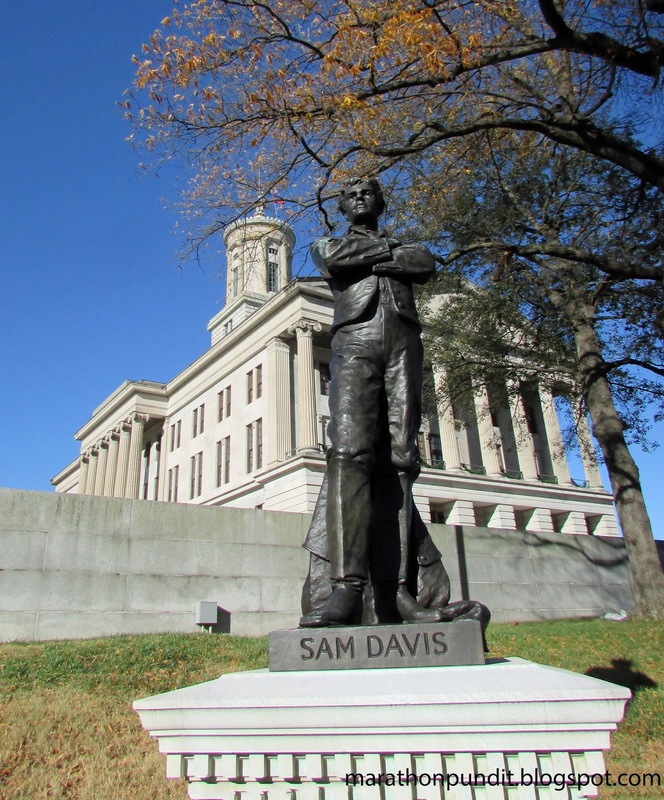 Sam Davis was a scout, or if you prefer, a spy for the Confederacy. He was captured by Union forces in 1863, in his possession were sensitive documents including sketches of enemy fortifications. In exchange for his life, a northern general asked Davis betray his sources. His response was, "I would rather die a thousand deaths before I betray a friend." Davis was hanged as a spy in Pulaski, Tennessee. 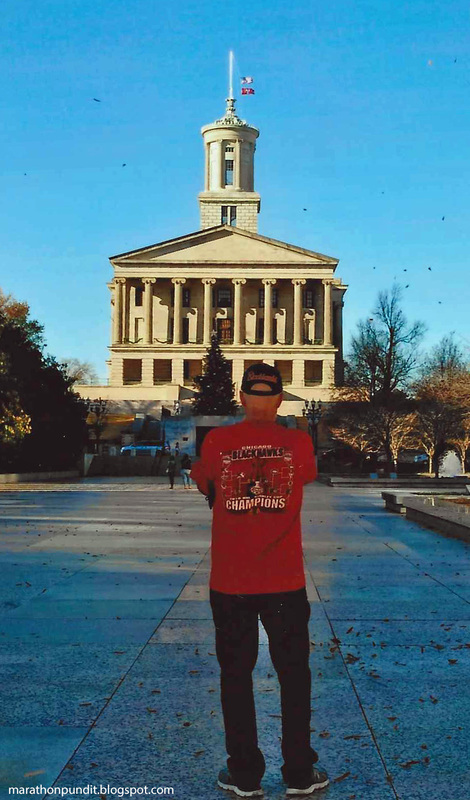 Two years ago leftists protesting a police convention being held in Nashville covered the Davis statue with a white sheet and placed in front of it a crude bust of Terence Crutcher, a black man who was killed during a traffic incident by a white police woman, Betty Shelby. She was acquitted of murder charges. 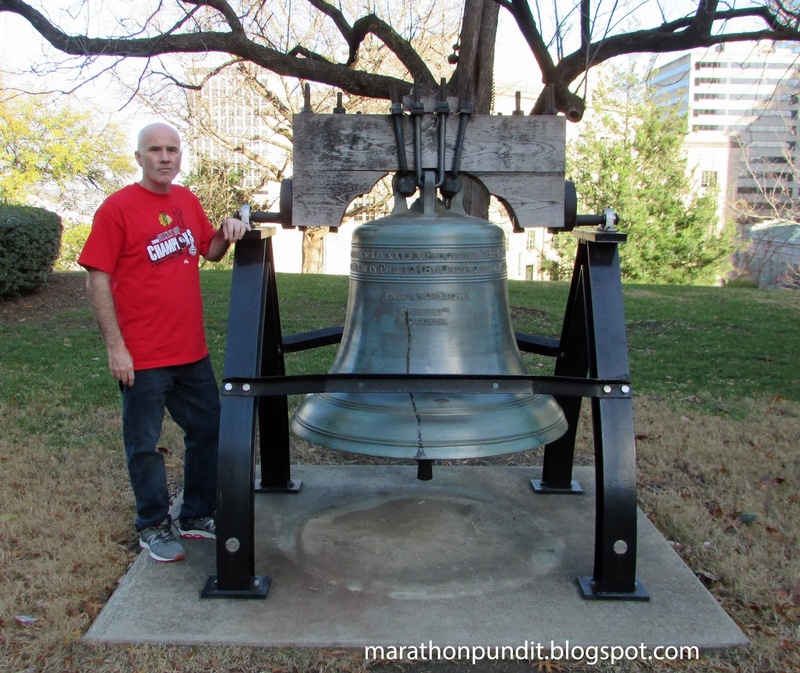 Next to your beloved Blogger Laureate of Illinois is a Liberty Bell replica. Across the street is War Memorial Plaza, which will be the subject of a future entry.